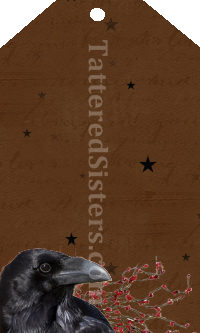 I decided to do another of my Primitive Hangtags today, since I'm still in creative mode. But I thought I'd do something that isn't really seasonal, and is just more primitive than anything else so it could be used for all occasions. 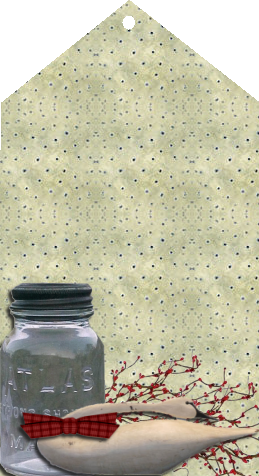 Now that image includes a Mason Jar (you just know I love Mason Jars! ), some Pip Berries, and either a goose or a swan. I haven't quite figured out which one it is. But I'm going with goose for now. :) Hope you like this Primitive Goose and Pip Berries Tag! Click once to enlarge it, then right-click and save to your PC. I'm still in the mood for a Primitive Fall, so today I made another Primitive Hangtag for everyone (like me!) who loves Primitive Crows and Fall. 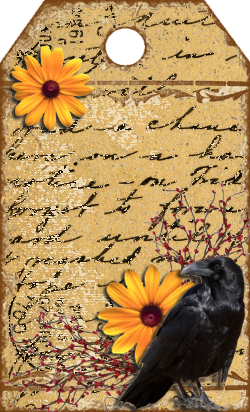 It's my Primitive Crow and Flowers Tag. Click on the image once to open it to full size, then right-click and save it to your computer. I hope you like the hangtag! OK, so I'm feeling all about the Primitive Pumpkins right now. :) I thought I'd share with you an alternative to my Primitive Putkas in a Jar that I posted about yesterday. You can put your putkas in a pouch too! 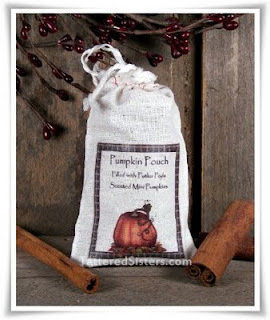 You can use the same recipe to scent your little pumpkin pods, but instead of putting them in a jar, you can put them in a muslin pouch instead (after they are dry, of course, which doesn't take too long after scenting since they are so porous). To decorate your pouch, just create a cute graphic label in your favorite printing or graphics program. Print it (in reverse if you are adding text!) onto iron-on transfer paper. Then just iron it onto your muslin pouch. These pouches of Prim Fixins are great for Primitive Gifts. And they're so easy to make, you can whip up quite a few of them in a relatively short amount of time. 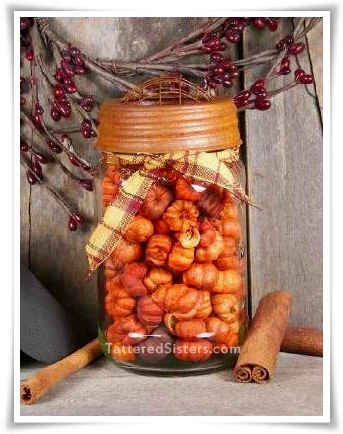 If you're having a Primitive Fall or Halloween-themed party, these would be perfect party favors too. I found this great Primitive Pattern while surfing for primitives today. 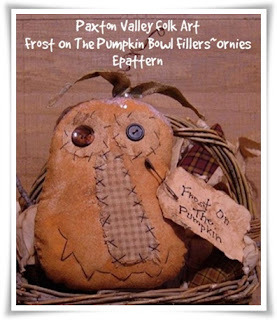 It's called Frost on the Pumpkin Bowl Fillers and it's created by Deb at Paxton Valley Folk Art. 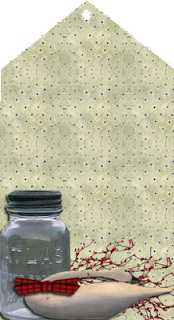 This is the perfect pattern to get your creative juices flowing for a Primitive Fall! What's better than Primitive Pumpkins! It's available for FREE download via Crafty Avenue. 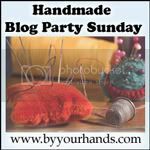 Just click on the link below to go to Crafty Avenue--it's an instant download. 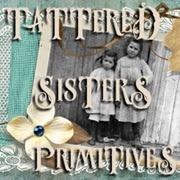 I thought it was about time to create and give away some new Primitive Freebies here on Tattered Sisters. 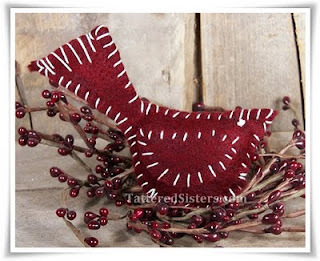 And since I love Primitive Crows, I used that for my inspiration. So I've created a Primitive Crow and Stars Tag in two sizes and they are available for free download! Here's a sample of it. Don't download that tag though, because it has my watermark on it. Use the links below to view and download each of the free tags. I hope you enjoy these free Primitive Hangtags! These are two of my favorite vintage and Primitive Home Decor items in my dining room. 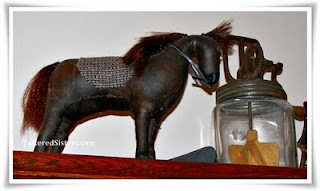 My vintage-looking rocking horse and my vintage butter churn.They are wonderful Vintage Goods that I treasure in my home. Now the rocking horse isn't truly vintage; it's a reproduction that I just fell in love with because I think it looks so primitive--and so much like a folk art piece. Love it. But the butter churn is definitely vintage. The Hubs and I got it at an auction years and years ago. I've always loved it. Both of these sit on top of the hutch in my dining room. It's hard to find just the right spot for things like that since they're so big, but my hutch seemed like the perfect place for these special treasures. What are some of your vintage treasures? Not quite sure why I have sewing on the brain lately, especially since I don't sew that much. But I created this cute little country and primitive Rusty Tin Bucket Pin Cushion the other day that I wanted to share. I just used a mini Rusty Tin bucket, along with a rusty tin star, a stem of burgundy Pip Berries, some homespun, one half of a 2" Styrofoam ball, and a circular piece of cardboard cut to the same size as the bottom of the foam ball. I also used some masking tape and hot glue. I cut the foam ball in half and covered it with some homespun, enough to have edges I could tuck over onto the flat bottom. I taped those edges down with masking tape. Then I added another piece of homespun to the cardboard circle and taped those edges down as well. Next I hot glued the covered ball and covered cardboard together, taped edges to taped edges. 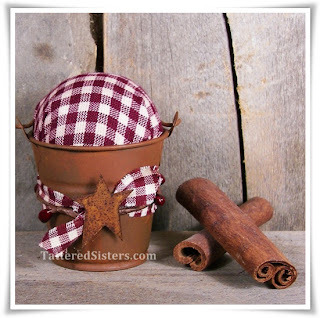 Next up I added a strip of homespun around the rusty tin bucket and then added the stem of pip berries. I topped that off with the rusty tin star, which I hot glued in place. The fabric-covered foam just sits inside the top of the rusty tin bucket. It lifts off and you can store some extra pins or other sewing notions inside.